The Jackson Hole Summit revealed a contrast of ideas from the major central bankers. On the one hand it gave the U.S. Federal Reserve a chance to talk up interest rate hikes and raise probabilities of at least one more by the end of the year. On the other it allowed the European Central Bank to reveal that their sub zero interest rates may be with us for a long time. The greatest concern was that the central bankers agreed they are nearing the limits of their policy's effectiveness without other government help. Banks in Europe have taken note of this and other concerns and are preparing for dire consequences. Before the summit began, economists and investors were unclear on where Janet Yellen and the Fed stood on interest rate prospects for the rest of the year. Comments from both her and her deputy Stanley Fischer certainly changed expectations. Yellen opened the door for the possibility of an interest rate hike even in September. She declared Friday in her speech at the Jackson Hole Summit that the case for a rate hike has improved with better labor market data and anticipation of moderate economic growth. Fischer then added weight to her remarks by stating that her comments for a possible rate hike in September were serious. He went on to say that they might manage to get in more than one rate hike before the end of the year. These two statements have completely upended the Fed Funds Rate hike odds. Bloomberg now shows a 42% chance of a rate hike at the September 21st meeting. By the early November 2nd meeting the odds increase to 47%. For the last meeting of the year on December 14th, the chances are now up to about 65%. This chart shows how dramatically expectations have risen for a rate hike even at the upcoming September meeting. They have more than doubled since the beginning of August. This would normally be seen as a negative for gold prices as gold is extremely sensitive to higher U.S. interest rates. Greater interest rates make the opportunity costs for keeping non-yielding bullion higher. They also boost the U.S. dollar that gold is mostly priced in and measured against. Yet spot gold prices held up fairly well last week only down 1.5%. It found support in other comments from the Fed, European Central Bank, and Bank of Japan officials. Benoit Coeure an ECB Executive Board member spoke at the Jackson Hole Summit as well. He reiterated their case for having cut the European interest rates significantly into sub zero territory at -.4%. They are giving banks free loans and also purchasing an incredible 80 billion euros of assets every month. Despite this, inflation in the Eurozone is steady at almost 0%, well below their 2% target which it likely will not reach for another two years at least. With all of this in mind, Coeure admitted that rates may have to remain at these low levels for an extended period of time. More troubling still were the comments made by the combined ECB, Bank of Japan, and Fed officials that their attempts to improve the economies using monetary policy will fail if the elected government officials do not come out with bold policy measures. Another surprise announcement this week concerned the long running TTIP free trade deal negotiations between the United States and the European Union. Both German and French government ministers have come out to announce that the agreement is basically dead in the water. The French and German ministers are blaming the lack of agreement on American protectionism and saying that the talks are near the point of collapse. “Those who are protectionist are Americans, Europe is very open,” the French Minister for Foreign Trade, Tourism, and French Nationals Abroad Matthias Fekl said to CNBC on Monday. He went on to add that France is ready to walk away from the Transatlantic Trade and Investment Partnership negotiations if progress can not be made. The Vice Chancellor of Germany Sigmar Gabriel took the comments a step further. He announced during the weekend that the TTIP deal has already failed, but no one is actually admitting this. French President Francois Hollande has made similar criticisms of the pact that shows favoritism to American business over the interest of Europeans. A large number of Germans have participated in grassroots protests against the arrangements. They are worried that the deal will lead to job losses, will decrease the high European standards of goods, or even give large corporations more ability to sue governments. Such opposition has only grown since the United Kingdom voted June 23rd to leave the European Union. Part of the motivation behind the Brexit vote lay in popular opposition to the TTIP. While some reports showed that this agreement would have negative consequences for Britain, the Confederation of British Industry insisted that the U.K. could have benefited by as much as £10 billion per year had it stayed in the EU and felt the TTIP come into force. Now it looks increasingly likely that neither Britain nor the EU will see the arrangements through. An anonymous source at an important investment bank has been telling CNBC that the European financial services firms are preparing for worst case financial scenarios to unfold as soon as the end of 2016. Much of this concerns the ongoing uncertainty surrounding Britain's process of leaving the European Union. They are not only worried about Britain triggering the Article 50 exit clause. The banks are worried about additional referendums on memberships in the remaining EU countries that even might cause the euro to break up. This theme is not limited to the major European banks either. European firms have been warning that they are concerned about the uncertainty in the future. Second quarter results' announcements have shared this concern out of companies ranging from the large investment banks to the auto industry to mining giants. They have blamed poor performance on this volatility in the markets and continuous uncertainty and predicted that the second half of the year will be similarly difficult. 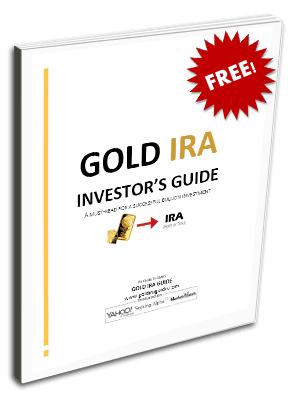 Gold in your retirement holdings and investment portfolio will be your best shield against this market uncertainty and volatility.